The Gospels record the life and teachings of Jesus Christ—the Savior and Lord whose promised return is good news! What can we learn from the Gospels? What are the Gospels, and why are they so important to study? Watch this short video by Foundation Institute instructor Dave Myers to discover why you should regularly read the Gospel accounts of Christ’s life. The word Gospels comes from the message that Jesus Christ preached, the gospel of the Kingdom of God (Mark 1:14-15). Gospel is translated from the Greek word euangelion, meaning “good news”; and the apostles would not have used the word in the plural since there was only one true gospel. “The four records which traditionally stand in the forefront of the [New Testament] are, properly speaking, four records of the one gospel” (The New Bible Dictionary, 1982, “Gospels”). The Gospels focus mostly on the 3½-year ministry of Jesus Christ and, especially, on the last week of His life. They give very little information about His life before age 30, and so they are not really intended as full biographies. The writers told the stories about Jesus Christ’s ministry, miracles, actions and teachings for a purpose. These books are intended to teach the reader God’s message—the good news of God’s plan to set up the Kingdom of God on this earth and how we can be part of that plan. The Gospels are intended to convict us of our sins so we will repent and believe in Jesus Christ. Each of the Gospel writers had a different audience and purpose in mind. 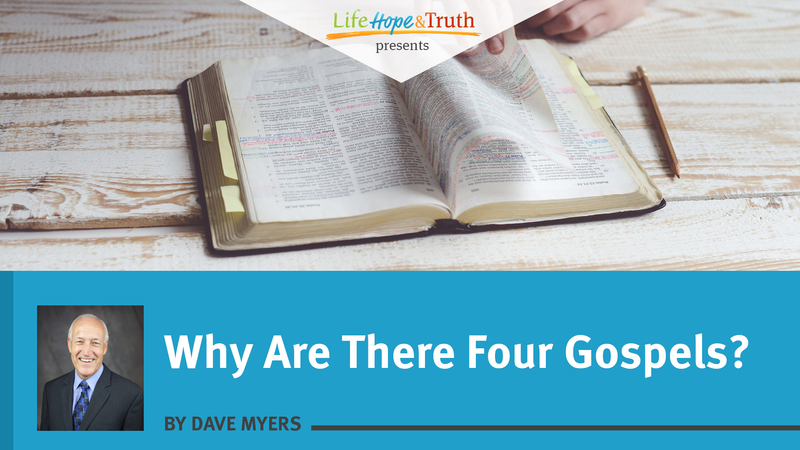 Though the writers may not have pictured their readers sitting down to compare and read the four Gospels together, God did have the bigger picture in mind. Out of all the many narratives written (Luke 1:1) and out of the vast number of things Jesus did and taught (John 21:25), God chose to preserve these four accounts for our benefit. Throughout the Bible God uses repetition for emphasis, and the story of His Son—our example, our Savior and our soon-coming King—is definitely worthy of the highest emphasis. Reading each Gospel separately will teach us a great deal about what is important to God and how we should live. Occasionally reading the four Gospels together using a resource that tries to harmonize them can give additional insights and a fuller picture of the events and teachings. One popular and helpful harmony is A Harmony of the Gospels for Students of the Life of Christ by A.T. Robertson (1950). Harmonizing the four accounts is challenging and brings out questions about seeming differences. Much can be learned by comparing accounts, and none of the apparent discrepancies are insurmountable. “Individual Gospels have their own characteristic ideas, images, settings, and emphases, while sharing a common core of material. As for alleged discrepancies among the accounts, we must remember not only that the story is told from four different perspectives, but also that as a traveling teacher and miracle worker Jesus said and did similar things in a series of different places. Even the parables may have been related differently as Jesus spoke to different audiences” (A Complete Literary Guide to the Bible, edited by Leland Ryken and Tremper Longman III, 1993, p. 370). Though each writer recorded different perspectives, the whole process was guided by God’s inspiration through the Holy Spirit. As Jesus Christ told His disciples, the Holy Spirit “will teach you all things, and bring to your remembrance all things that I said to you” (John 14:26). The Bible tells us that Matthew was a tax collector. His profession was despised by his fellow Jews because publicans supported the Roman occupiers and because they frequently extorted additional money for themselves. Jesus called Matthew to be one of His disciples and apostles, so Matthew left his previous profession and spent his full time traveling and learning from Jesus Christ. He was an eyewitness of the events he records. The Bible does not give Mark’s previous profession but mentions his work in preaching the gospel with Paul, Barnabas and Peter. Tradition says that Mark’s Gospel reflects Peter’s eyewitness testimony of Christ’s life. Mark’s “emphasis on Jesus’ mighty and miraculous works makes this Gospel action-packed, fresh and vivid. … In general, Mark presents the miracle-working Jesus, not the teaching Jesus” (The Nelson Study Bible, p. 1636). Luke was “the beloved physician” (Colossians 4:14) and companion of the apostle Paul. He had read many other accounts of Jesus’ life; but using interviews of eyewitnesses and careful research, he determined to write “an orderly account” for Theophilus, “that you may know the certainty of those things in which you were instructed” (Luke 1:3-4). Dr. Halley describes Luke’s special emphasis on Jesus’ humanity and His kindness to the weak, suffering and outcasts (p. 485). At the end of his Gospel, Luke recorded Christ’s statement to the disciples explaining how the prophecies about Him in “the Law of Moses and the Prophets and the Psalms” had been and would be accurately completed (Luke 24:44-49). John was a fisherman when Jesus called him to be a disciple and apostle. John focused his eyewitness account heavily on the last days and hours of Christ’s life. The apostle John explained his reason for including the material he did in his Gospel: “And truly Jesus did many other signs in the presence of His disciples, which are not written in this book; but these are written that you may believe that Jesus is the Christ, the Son of God, and that believing you may have life in His name” (John 20:30-31). The four Gospel writers did not intend their audiences to read their books for entertainment, or even just for information. They wrote to get a message across—a message of warning and of hope. The Gospels are a call to action. As Jesus Christ summarized it: “The time is fulfilled, and the kingdom of God is at hand. Repent, and believe the gospel” (Mark 1:15).